What is the difference between an alphadoku puzzle and a Sudoku puzzle? This Alphadoku puzzle is created from a nine-letter word. 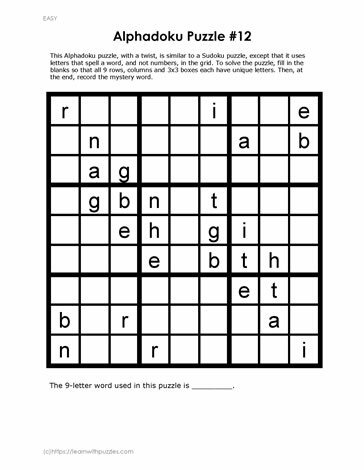 Each unique letter is found once in each column, once in each row, and once in each three-by-three grid. This contrasts the basic Sudoku puzzle where it's created using digits from 1 to 9. To solve the puzzle, use basic Sudoku rules.